Vaca do Cerrado | CowParade New Figurines | One Price Low Flat Shipping! From the CowParade Medium Sized Cows Collection,Vaca do Cerrado. Made of ceramic. Measures 4" x 6". Featured at the CowParade Goiania, Brazil 2012 exhibit. Designed by artist, Alexandre Liah. 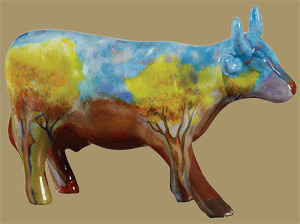 This decorative cow figurine is painted in a watercolor style, featuring pastel blue sky with yellow trees.